With the busy pace of life, on-demand delivery apps have made a significant place in the society. Lack of time and busy schedules of the people have increased the use for the on-demand mobile apps for the procurement of the basic requirements of life such as food, grocery, house hold services, car wash, spa booking. So, if you are into grocery business and looking forward to grow your customer base, get a mobile app for your grocery store today. 1. Customized grocery app: The grocery app will provide your customers with a personalised shopping experience, with providing you suggestions of the fruits and vegetables, from their previous shopping history. So, the customers can get the groceries of your choice, in a shorter span of time. 2. Store locator: This app helps your customers to locate your store easily, thus helping them to visit your brick and mortar store if they want to. 3. Lucrative offers: Using the mobile app, you can provide lucrative offers to your customers, thus encouraging them even more to download and use the app. The app only offers are useful and attracts a huge customer base. 4. Flexible payments: The grocery app offers flexible payment options such as net banking, payment using debit and credit cards, cash on delivery, thus giving the customers the ease of payments. 5. Pre-planned delivery: You can schedule the delivery of the grocery according to the preferred delivery time of the customers. This will help them plan other activities, based on the grocery delivery schedule. 6. Detailed price and nutritional information: The actual price, along with the amount ordered can be viewed by the customers. They are able to refer to these orders later and compare the prices over a period of time. 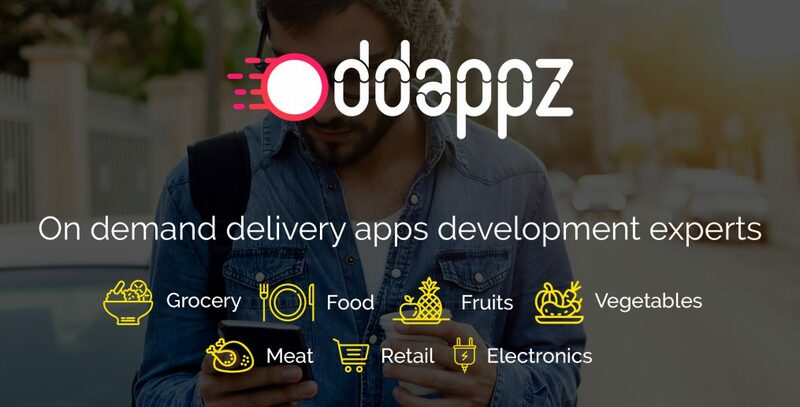 Grocery delivery apps such as the Peapod clone, amazon fresh clones have become popular and many mobile app delivery companies are developing these grocery delivery software to help the grocery business deploy their own app. Online food ordering and delivery has made a permanent position in the industry. You need to refine your marketing goals to get your business going at a pace with which the industry is upgrading itself. Here are some of your marketing goals for 2018 and ways to achieve it before the year ends. Taking food orders over the call is one of the most conventional ways of serving your customers. But, it’s time to get these customers come online. Send out promotions and business cards mentioning your online presence. Advertise and promote that their favourite food destination is now online. Offer promo codes and discounts to the customers who orders food online, rather than over the phone. Every business wishes to ensure that they get repeat customers. However, in order to ensure that, provoke your customers to get their favourite food, even on the busiest day. Promote that the customers do not have to come down to the restaurant to order food, the restaurant on the other hand is at their doorstep with the mobile apps and online food ordering software. Adverse climatic conditions are always a major headache for restaurants. This is because, customers avoid dropping in, on a rainy day or a stormy one. This worry is crushed down with apps like Foodpanda clone. Tell your customers that they can get their favourite food at their door-step even on the worst weather. 1. Huge customer base: The mobile and smartphone users form a huge customer base for any business. Most of the customers prefer to use the mobile app, instead of using the websites. Hence, in order to reach such a huge customer base, a mobile friendly eCommerce needs to be set up, attracting more customers to use the mobile app and buy the products and services. 2. Maximum traffic to websites come from the mobile users: It is a fact that more than half of the traffic in the various e-commerce websites come from the mobile users. Hence, it is a loss on the part of the business, if with the lack of mobile friendly eCommerce, deflects the mobile app users. The eCommerce website will miss out a huge amount of traffic without deploying user-friendly mobile apps. 3. Mobile users prefer buying on the go: Studies highlight the fact that the mobile users are big buyers. Hence, an user-friendly and effective mobile app, will definitely enhance the business much more than the websites version. 4. Mobile responsiveness is favoured by Google: A fact unknown to many, in 2015, Google started using mobile-friendliness as a parameter for providing better rankings. So, if you want a better ranking for your eCommerce, ensure to make it mobile friendly. 5. Social media shares are much more among the mobile users: While using the mobile apps, you will find the share buttons everywhere. Whereas is websites, it is hardly seen. So, mobile app users are likely to share about your eCommerce site much more and more often than the website users. So, if you have been considering the mobile apps, just a substitute of the websites, now you know, it has a much more to give to your business. The overall on-demand market place is being ruled by the mobile apps. With time, the on-demand economy will be ruled by the on-demand food delivery system, on-demand grocery delivery system, on-demand parcel delivery apps, on-demand home service booking and delivery systems. As predicted by the Harvard Business reports, these on-demand economy has attracted $57.6 billion, from 22.4 million customers. This number is likely to increase with time and the future of the on-demand economy lies in these industries. The new face of business has changed with the on-demand economy dominating the industry. Customers now depend on these on-demand platforms for the basic services such as plumbing, grocery shopping, essential home services and food delivery. This the huge increase in the demand for these services, the entrepreneurs are investing a lot of money on developing these on-demand mobile apps. With the success stories of the on-demand services such as Uber and Foodpanda, the future of the economy indeed lies in the usage and development of the on-demand service apps. The revolution of the on-demand services have already started. With time the services are becoming even more effective and personalised. Thus, a bright future lies for the on-demand app development companies, as well as the entrepreneurs investing in these ventures. Food delivery marked its beginning during the period followed after the World War II. During this period, women volunteered to cook food at their houses and and serve the people affected by the war. However, with time, the concept of food ordering and delivery has changed a lot. Online food ordering and delivery system is indeed a boon that technology has gifted to us. From being a luxury, online food ordering has become a necessity in order to cope up with the speed of life. There are certain pros and cons of the online food ordering and delivery systems that affects the entrepreneurs as well as the customers significantly. It is indeed a good investment to give a significant boost to your business. The success of the online food ordering and delivery systems have been proved with the success of the companies such as FoodPanda and UberEats. The food ordering and delivery app gives you the access to the wider business world, with the ability to reach more customers. With online food delivery system, your food will reach to global customers, thus providing you name and fame. Since the latest trend of food ordering and delivery system is becoming popular everyday, hence in order to remain in competition, going online with your food menu is essential. The weather barriers that affects your business adversely is also removed with the deployment of the online food ordering and delivery system. Extreme weather conditions such as rain, storms, snow or heat waves prevents the customers from leaving their houses to visit the restaurants. Going online means overcoming these weather barriers since the food could be delivered to the door-step of the customers. Thus, in such extreme business conditions, your business is never in recession. If the online ordering system is reliable and efficient, then it will lead to a greater sale as well as greater profit. Thus, a larger revenue will be generated for the business, thus making it a success. Offering online food ordering and delivery platform to the customers might prove to be a costly affair for the restaurant. The restaurant might not be able to gain a profit, with the costly mobile app or online web platform. Along with the employees for running the restaurant, you need a bunch of employees to run your online platform and deliver food to the customers. This is an additional cost and resource management. Delivering food on time is a major challenge. There are many barriers between the timely delivery of the food and the customers. These include adverse traffic conditions, adverse weather conditions, too many orders at a time, food items out of stock. These conditions causes delay in the delivery of the food, thus hampering the reputation of your brand. One of the major cons of online food ordering and delivery system is the compromise in the food quality. Since the customers are not met in person, the quality of food is often not up to the mark, as usually served in that particular restaurant. Hence, many customers might judge a restaurant and its quality of food, with the quality of the food delivered online. This deflects many potential customers, thus incurring loss for the restaurant. The online food ordering and delivery industry has received an immense upliftment with the help of technology. Even though there are certain disadvantages of the online food ordering and delivery system, yet the huge number of advantages makes it the best possible business prospect and a proven method of success for the restaurants. Serving the best quality food with the best delivery services is just not enough to ensure success in your mobile app food business. You need to ensure that people know what service awaits for them. Marketing is an essential activity for any business. Marketing your products help your potential customers to know what exactly you sell. Here are some proven tips for marketing, that will ensure your business fly high. Involve your customers: It is important to involve your customers from the initial stage of your mobile app business. The first step to draw attention of your potential customers is to put a brand name, that is catchy and attractive to the customers. You can share social posts or a naming competition, asking for inputs from the customers. The people responding to those posts, will surely come back to check your mobile food delivery app. Invest in commercial advertisements: Commercial advertisements such as televisions, radio, magazines, newspapers as well as hoardings and placards are important and proven tools of effective marketing. Invest a good amount on these and they will ensure to give back double the amount invested. Be active on the social media platform: Social media platforms are the most active places for marketing and promotions. Make regular posts on Facebook, Twitter and other social networking sites. Make the posts interesting and arouse the curiosity among the people. Increase the number of likes and followers. These people, in turn will become your potential customers. Rely on the power of word-of-mouth: The word-of-mouth is a powerful tool. You can convince your customers best, by using the word-of-mouth of other customers. The loyal and proactive customers will in turn fetch new customers for your mobile food business. Contests: Organize various contests and give discount coupons and promo codes as prizes, to ensure to attract a lot of customers. Free items attract people. Provide free food items for the initial days of your business. Improve your customer relation: Engage in enhanced customer relation. Offer personalized offers and food items based on their previous search. Give importance to the ratings and feedbacks provided by the customers. This makes your customers feel important, thus acting as your powerful marketing tool. Implement these marketing strategies in your mobile food ordering business and witness the best results for your business.